I created this cute interactive card for the Crafting By Designs Color Challenge. Sparkle N Sprinkle is sponsoring this challenge, and offering a prize of $15 gift certificate to their store! Check out the challenge and submit your creation!! Join in on the Crafting By Designs Color Challenge — All you gotta do is choose 3 colors from this color palette and make something! I chose the yellow, orange, and pink combo of the tulips. 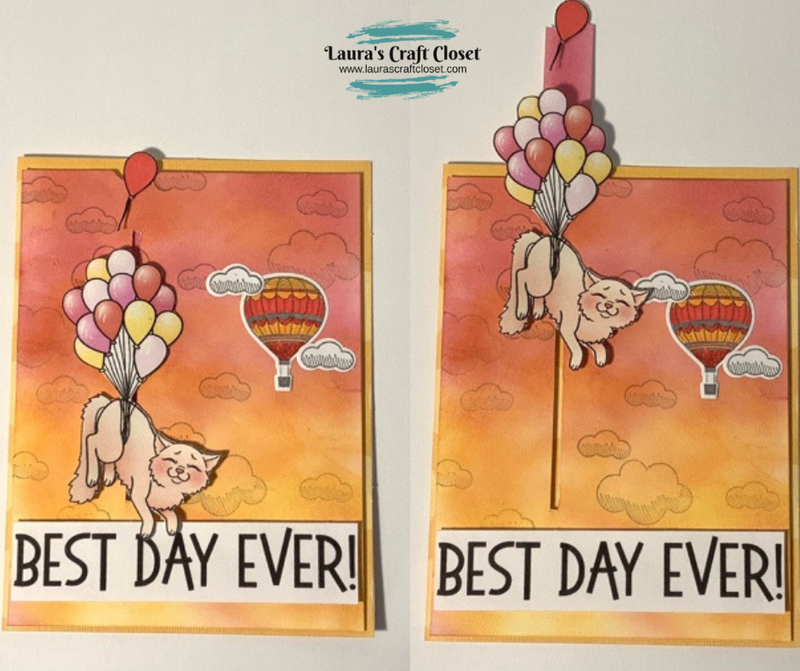 I created this with the Kitty Celebrates image set — It’s just too cute and it reminds me of one of my cats, with that smile on her face. I can’t help but smile when I see it! Making interactive cards are a bit more time-consuming, but this image needed to be able to “float” up! The few extra minutes is worth it in my opinion, as your recipient finds it extra surprising! See below for how I created it! Sponge ink from the ink pads onto white cardstock, starting with the daffodil delight (yellow), then the mango melody (orange), and finish it with the flirty flamingo and a touch of poppy parade. Stamp the clouds in basic gray randomly all over the background. Cut a 3″ narrow slit 1 1/2″ from the left side. Print out your digital images and stamp your layered images. 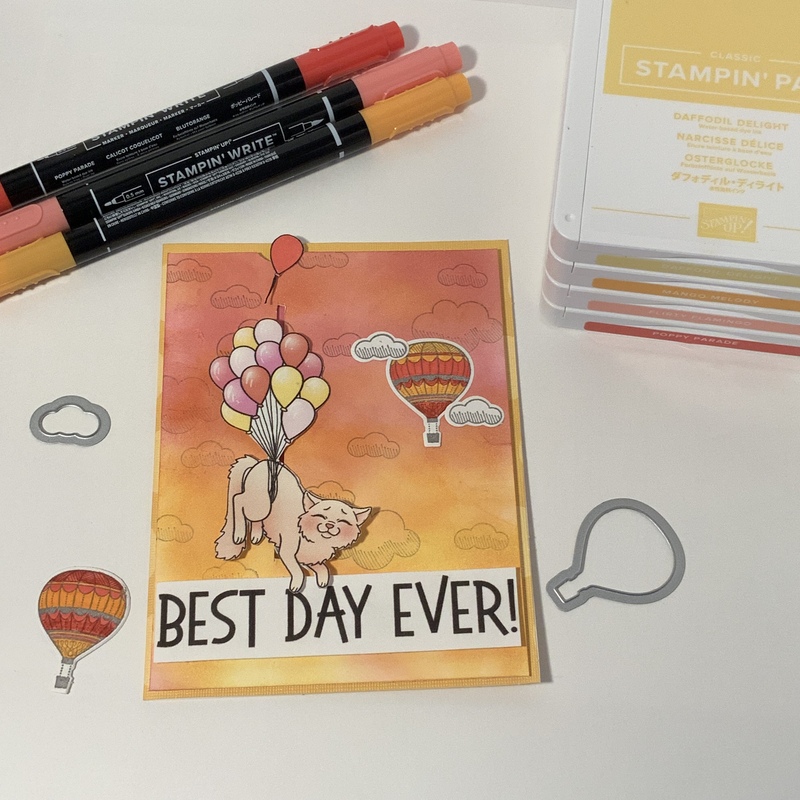 The kitty and balloons is 3 1/2″ tall, and the sentiment is 4″ wide. Stamp and die-cut the small hot air balloon and clouds in basic gray. Color with the same colors as on the background. Need any help working with digital images? This complete guide will step you through it! Create pull tab mechanism with the kitty image. Cut a scrap piece of white cardstock 4″ x 3″. Make the 1/2″ wide tab using this template below. Cut the hatched area out. Fold the inner dots toward its center and slide the folded bottom piece into the slit of your background from the back to the front. Fold on the outer dots outward, so it opens like a butterfly. Your tabs will be larger than your cat, so with the tabs flattened outward, trace your cat image, and trim the tabs to fit. Attach your cat (but not the balloons! using the Tear and Tape. This has a stronger adhesive that is necessary for a piece that’ll be moving. Attach your background with the mechanism with dimensionals to your cardbase. Attach the sentiment on the front of your background (maybe with the little paws hanging over!). I’d love to know what you thought of this tutorial! If you have any questions, feel free to leave a comment below or send me an email. I love hearing from you! Happy Crafting!